Family law program in limbo Critics call on feds to renew funding BY ELIZABETH THOMPSON For Law Times T he federal justice depart- ment is facing calls for it to renew the funding for a multimillion-dollar family law program that provides grants for projects and resources to help couples who are splitting up. Since 2009, the Supporting Families Experiencing Separation and Divorce Initiative has funded a wide range of projects from an innovative web site for families going through a separation to a pi- lot project in Nova Scotia to help in cases of high-conflict divorces. However, the program was quietly allowed to sunset on March 31, and the justice depart- ment can't say when it might be renewed. NDP justice critic Murray Rankin says the initiative is ex- actly the kind of program that Canada's legal system needs. "I can tell you that family law is a woefully underfunded area that affects so many people that one would hope that the government would continue to fund initiatives that could make a difference in the lives of Canadians," he says. "Here you have a positive pro- gram that is making a difference to people's lives. Rather than just ax- ing the program — or, to use their euphemism, sunsetting it — why don't they do a fresh review and see whether it could be improved?" One of the problems divorc- ing couples face is the cost of legal advice — a problem the program addresses by helping to educate those going through a divorce, says Rankin. "One of the things that is so problematic about family and divorce law is that so few of our legal aid programs have any bud- get to allow people who are going through that crisis period to get assistance. Legal aid is woefully underfunded." 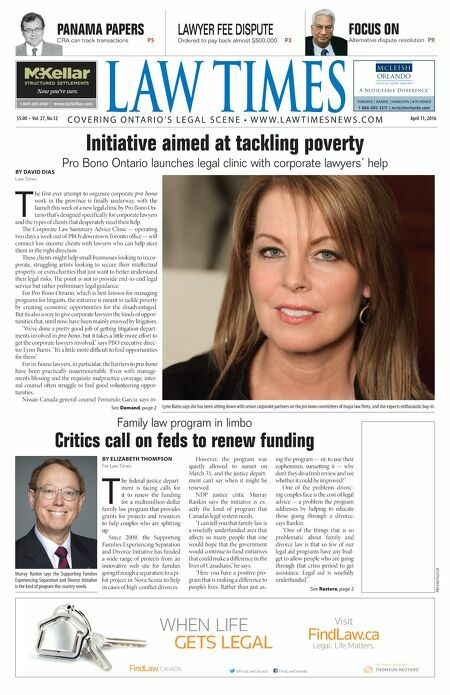 Initiative aimed at tackling poverty Pro Bono Ontario launches legal clinic with corporate lawyers' help BY DAVID DIAS Law Times T he first ever attempt to organize corporate pro bono work in the province is finally underway, with the launch this week of a new legal clinic by Pro Bono On- tario that's designed specifically for corporate lawyers and the types of clients that desperately need their help. e Corporate Law Summary Advice Clinic — operating two days a week out of PBO's downtown Toronto office — will connect low-income clients with lawyers who can help steer them in the right direction. ese clients might help small businesses looking to incor- porate, struggling artists looking to secure their intellectual property, or even charities that just want to better understand their legal risks. e point is not to provide end-to-end legal service but rather preliminary legal guidance. For Pro Bono Ontario, which is best known for managing programs for litigants, the initiative is meant to tackle poverty by creating economic opportunities for the disadvantaged. But it's also a way to give corporate lawyers the kinds of oppor- tunities that, until now, have been mainly enjoyed by litigators. "We've done a pretty good job of getting litigation depart- ments involved in pro bono, but it takes a little more effort to get the corporate lawyers involved," says PBO executive direc- tor Lynn Burns. "It's a little more difficult to find opportunities for them." For in-house lawyers, in particular, the barriers to pro bono have been practically insurmountable. Even with manage- ment's blessing and the requisite malpractice coverage, inter- nal counsel oen struggle to find good volunteering oppor- tunities. Nissan Canada general counsel Fernando Garcia says in- PANAMA PAPERS CRA can track transactions P5 LAWYER FEE DISPUTE Ordered to pay back almost $500,000 P3 FOCUS ON Alternative dispute resolution P9 See Restore, page 2 See Demand, page 2 PM #40762529 $5.00 • Vol. 27, No.12 April 11, 2016 L AW TIMES & $#&!&jmmm$cYa[bbWh$Yec ntitled-4 1 12-03-20 10:44 AM C O V E R I N G O N T A R I O ' S L E G A L S C E N E • W W W . L A W T I M E S N E W S . C O M TORONTO | BARRIE | HAMILTON | KITCHENER 1-866-685-3311 | mcleishorlando.com cLeish Orlando_LT_Jan_20_14.indd 1 14-01-15 3:15 PM WHEN LIFE GETS LEGAL FindLaw.ca Legal. Life Matters. Visit @FindLawCanada FindLawCanada Findlaw_LT_Apr11_16.indd 1 2016-04-06 3:20 PM Lynn Burns says she has been sitting down with senior corporate partners on the pro bono committees of major law firms, and she expects enthusiastic buy-in. Murray Rankin says the Supporting Families Experiencing Separation and Divorce Initiative is the kind of program the country needs.